Despite growing demand for better walking and biking infrastructure in San Mateo County, active transportation grants from the City/County Association of Governments of San Mateo County (C/CAG) cover only a fraction of the projects that cities want to build, leaving many residents without the sidewalks, bike lanes, and other basic ingredients they need to safely navigate their streets. Cities recently submitted funding requests for 19 walking and biking safety projects from the county’s Transportation Development Act funds, a pot of state money distributed by C/CAG every two years. But C/CAG’s latest grant provided only $1.6 million, enough for eight projects. It would take $3.8 million to fund all 19 projects that cities in San Mateo County want to build. C/CAG staff advised cities spurned for this funding to apply for the upcoming County Transportation Authority Measure A Pedestrian and Bicycle Program, another paltry funding source overwhelmed by demand. That program, which allocates 3 percent of a half-cent county transportation sales tax to bike and pedestrian projects, awarded funds to just 16 of the 41 projects that applied for the latest grant in 2011. That year, project requests totaling $11.2 million competed for $4.5 million. On Thursday, the TA Board of Directors is scheduled to review applications for this year’s funding round — 23 projects totaling $9.3 million competing for $5.4 million. The funding awards are expected to be announced on April 3. Of the eight projects that were funded through the Transportation Development Act money, six will construct badly-needed sidewalks, crosswalks, and bike lanes in Daly City, Pacifica, South San Francisco, San Mateo, Menlo Park, and East Palo Alto.The other two projects are bicycle and pedestrian plans for San Bruno and Belmont, neither of which has ever written such a plan. This is the first year bike/ped plans were eligible for TDA funds. Daly City will use its funds to construct sidewalk curb extensions at some intersections and conventional bike lanes adjacent to car parking on the three-quarter-mile section of Geneva Avenue that lies within its city limits, from Cow Palace to Bayshore Boulevard, complementing the (mostly) continuous sharrows and bike lanes on San Francisco’s much longer section of Geneva to the west. John Daly Boulevard is also poised to get bike lanes and pedestrian safety measures in a project not funded with TDA money, but with $1 million from the federal One Bay Area grant program, according to the SF Examiner. Daly City has also applied for funds from Measure A and Proposition 84 urban-greening grant funds, but they haven’t been secured yet. 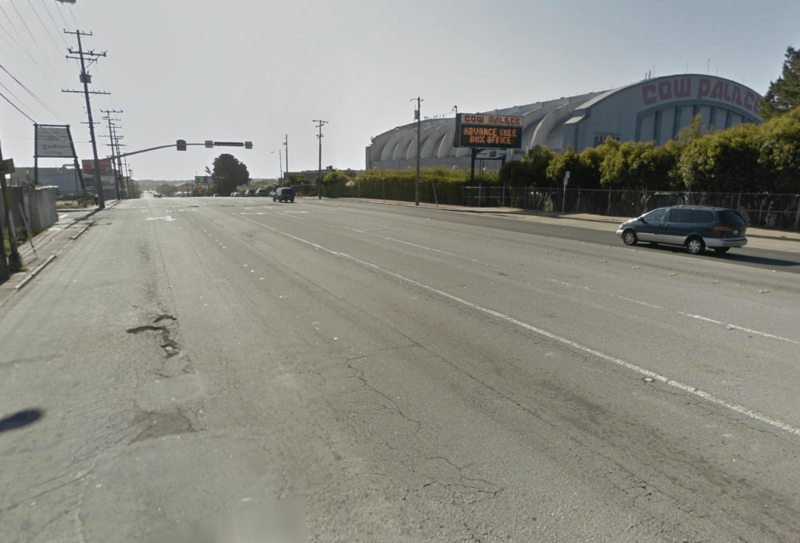 South San Francisco has plans to install sharrows on Oyster Point Boulevard east of Highway 101, including the street’s enormous ten-lane intersection with Gateway Boulevard. Between Gateway and Marina Boulevards, existing bike lanes will get green paint and new markings to bring them up to state bike lane design standards. They will be widened to meet the three-foot minimum width of non-gutter pavement (the bike lanes have storm drains in them), and at locations where they’re placed along the right side of a right-turn lane at Gull Drive, they’ll be moved to the left. Missing signs and pavement markings will also be installed. Menlo Park plans add bike racks downtown, make Safe Routes to School safety improvements at Encinal School near Middlefield Road, and beef up its bikeway network with short sections of green bike lanes at nine key intersections with high bicycle and motor traffic. Menlo Park city staff hope that highlighting bike lanes and merging zones with green paint at some intersections will discourage drivers from blocking them and clarify where to expect bicycle traffic. The new bike racks should also help alleviate the bike parking crunch in downtown Menlo Park, especially along Santa Cruz Avenue on weekends, when more shoppers visit the downtown retail district. Three pedestrian safety projects were also awarded TDA funds: San Mateo will be able to re-time downtown traffic signals to provide leading pedestrian intervals, Pacifica will install warning lights at crosswalks in front of five public schools, and East Palo Alto will construct sidewalks on several blocks of the Woodland neighborhood west of Highway 101. The dense Woodland neighborhood is crammed with parked cars and many points of conflict between drivers and pedestrians, but few streets have sidewalks, a legacy of the area’s unincorporated status before East Palo Alto was formed in 1983. San Mateo County allowed many residential areas to be developed without requiring developers to install sidewalks, including some with multi-family apartment buildings such as Woodland. Since there are no schools on the west side of 101, sidewalks couldn’t be built with Safe Routes to Schools funds, and the city had to rely on TDA funds instead, said East Palo Alto Planning Manager Brent Butler. Without funding, the other $2.2 million in projects that cities applied for in this round aren’t expected to be built anytime soon. Meanwhile, San Mateo County is moving ahead with plans for multiple highway interchange reconstruction projects that will cost between $20 and $35 million each, not to mention a Highway 101 widening from San Bruno to Redwood City that’s projected to cost up to $180 million, even though the county could simply make better use of 101’s existing lanes. 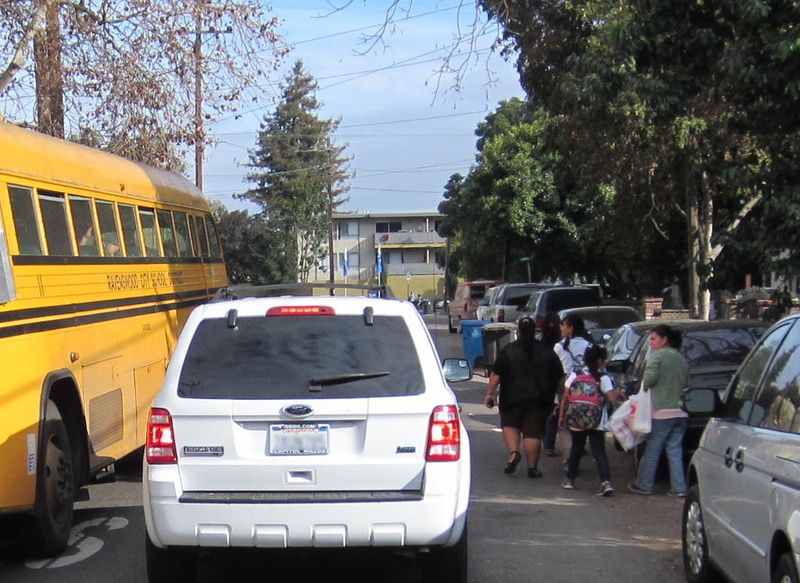 Redwood City sought $400,000 for safety improvements for children walking at five elementary schools for its Safe Routes to School program, but was awarded just $46,000 by C/CAG, the amount left over after funding the eight projects that were ranked higher by the agency’s Bicycle and Pedestrian Advisory Committee. 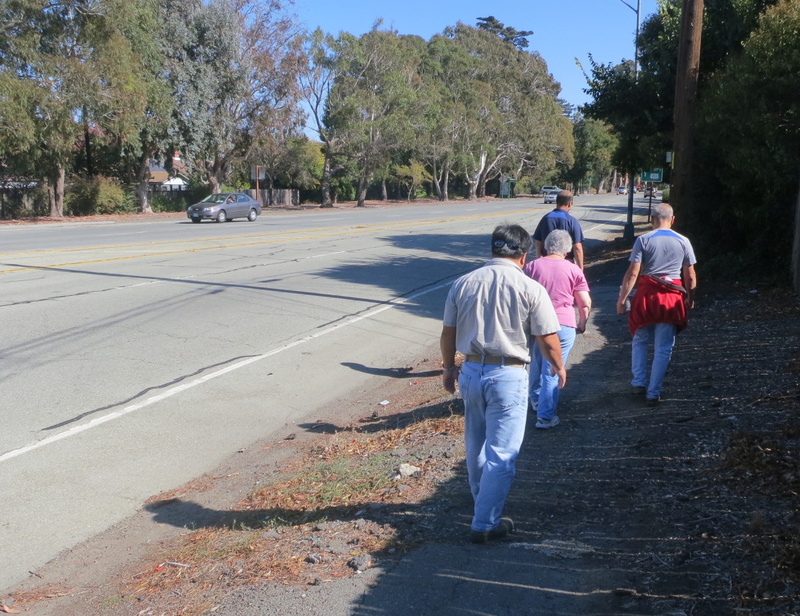 Also unfunded are missing sidewalks along El Camino Real in Burlingame, including the section from Ray Drive to the Mills-Peninsula Hospital on Trousdale Drive (about a fifth of a mile) and another missing sidewalk along Tower Road, located near the interchange of Highways 280 and 92. Residents arriving by bus there must currently walk up to a third of a mile in the shoulder-less street to access a variety of county services, including a preschool. Throughout the county, a number of other crosswalks, bike lanes, signage, and warning lights that would make dangerous spots safer for walking and biking are still without funding. These are basic measures that San Mateo County cities have deemed critical to keep residents safe and healthy, and the slow drip of funding from C/CAG is a chronic problem causes important fixes to be delayed for years. A recent high-profile example is the green buffered bike lanes on Alpine Road at Highway 280, which were installed in late 2013 only after resident Lauren Ward was killed by a truck driver while bicycling home three years prior. Requests to fund the project were not granted by the San Mateo County TA in 2011 or 2012. For bigger walking and biking projects, such as the Ralston Avenue Ped/Bike Bridge over Highway 101 in Belmont, the delays are even more severe. 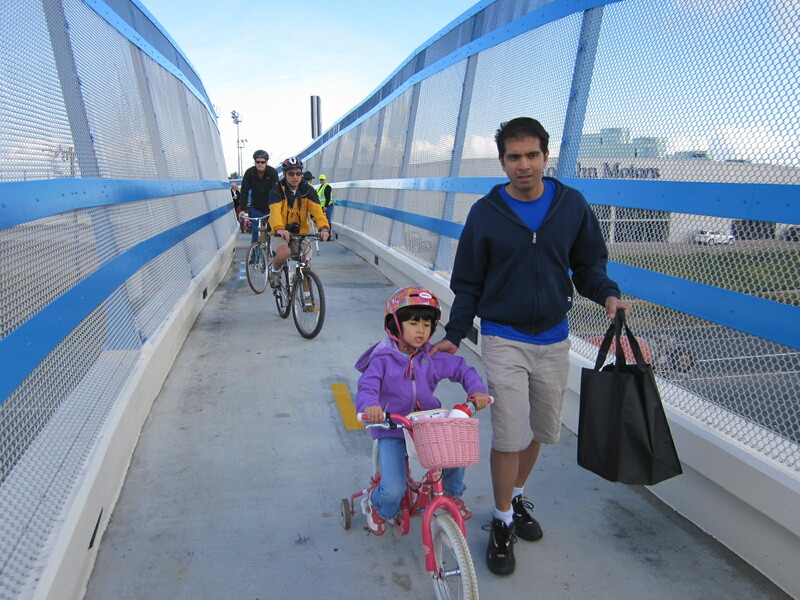 The highway interchange was widened in 2005 from four to eight lanes, but it didn’t include any bike lanes or paths and only narrow sidewalks, making walking and biking from Belmont to Redwood Shores and Foster City on the east side of 101 even more treacherous. Belmont had to piece together grants from eight different federal, state, county, and city funding sources, delaying the pedestrian bridge’s construction until mid-2011. San Mateo County’s 2011 Comprehensive Bicycle and Pedestrian Plan calls for an investment of $191 million in an interconnected system of safe, convenient, and universally accessible bicycle and pedestrian facilities in order to help reduce traffic injuries and fatalities and “enable people to meet their daily needs without access to a car.” Over $1.5 billion has been generated by the county’s half-cent transportation sales tax, Measure A, since it began in 1989, but less than 1 percent of that has been spent on bicycle and pedestrian projects. San Mateo County has some of the highest real estate values in the entire country. Thanks car-centric suburbia and Prop 13! I have been on a mission to find the bike lane near my office in San Mateo. I am still searching for the connecting route, and I notice most people on bikes just use the sidewalk. Presumably because the infrastructure is so terrible. And the lights are timed poorly crossing El Camino, with the green happening 1 second after the man stops flashing. It feels very dangerous walking around here. If you are a motorist, you will love Daly City. However, if you ride a bike or walk instead of drive, sad day for you as the Bike and pedestrian infrastructure stinks incredibly bad due to super wide roads, narrow side walks, dangerous intersections for pedestrians and virtually non existent bike lanes. Us cyclist and pedestrians in Daly City need some help real bad!!! There are actually a lot of bike lanes in Daly City. It’s just that most of them at on 15% grades or up on the top of them. Imagine how much higher they would be if the communities in it were actually walkable and bikeable. Yeah, the Google Maps bike layer always tells me to take Hillside which is laughable. Junipero Serra through much of Daly City is a much flatter route but has no bike lanes despite being a rare relatively flat north-south arterial that even connects with BART! San Mateo County is full of arterials (not just Caltrans-controlled ECR, though it consistently has got to be the worst) that only have sidewalks on one side here, then flipped, crossings on one side this time, then flipped the next, etc. In general it’s absurd how bad it is to be a pedestrian or bicyclist there….even in the flat parts. I live in the Ingleside area of SF and regularly go to San Bruno–the Centennial Way path from SSF station to San Bruno station is great but I find that the bike situation between Daly City station and SSF station is such a no-man’s land I just take my bike on BART there rather than brave out biking in that area. Caltrans-controlled ECR is an embarrassing archaic throwback to the 1950s era. Like a living, very annoying and dangerous museum played out still every day today! I always laugh at the crossing on ECR at Euclid Ave/Bayhill Dr in San Bruno (I’m sure there are many others the same). You press the button to cross and the automated voice says WAIT. And, oh, yes. That’s exactly what you’ll be doing. For awhile. It takes forever to cycle through and barely gives you enough time to cross as the cars sit there impatiently glaring at the odd pedestrian daring to exist. Some stretches don’t even have a sidewalk on both sides, and then it can flip sides, forcing you to cross again at inconvenient times even if you really needed to stay on that side of the road for later. I really only know this because ECR is one of the only flat routes through areas like Colma and would be great for biking but there’s no way I’m sharing that road with cars in its current state. So sidewalk it is. When it even exists. It is just a terrible, terrible road all the way from Daly City to the South Bay. Gosh, I have to use the death stare several times a day. The cars look so irritated you are crossing the street and preventing them from turning. And don’t get me started on the people who think the intersection line includes the crosswalk while waiting for the light. The crossing time is so short, walking at normal pace means I just barely make it. What if you are slower or impaired? No way you can make it across the street. I ride Hillside all the time, it’s a nice road, not pancake flat but only the last little bit is really steep. I am talking about bike lanes on roads like Callan and King, which are *very* steep. I take Hillside to Lawndale to SSF BART. But don’t know how long it’ll be before something like that can happen throughout. Oh yeah I’m sure Callan and King are really steep. I just find Hillside is too steep for doing something like going south on the Peninsula to work. Whereas Junipero Serra + ECR are pretty flat in that stretch and ECR more directly aligns with Centennial once you get there. Better keep them crappy car-sewers then. That would be Palo Alto. I know that, Bruce. I live in Mountain View. What I’m saying is that looking at comparable properties in Palo Alto indicates just how much higher the San Mateo Co properties would be if they were walkable.